Edinburgh's controversial new trams have been launched with the help of schoolchildren, officials and a flashmob choir. 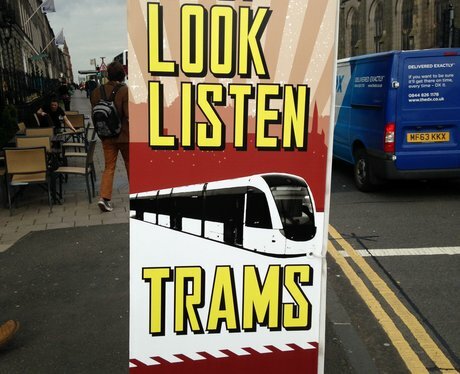 A safety sign warning pedestrians about the trams on York Place in Edinburgh. One of Edinburgh's new trams. Officials and guests gather at the launch of Edinburgh's trams in York Place. Heart's Elspeth Badger with driver Craig Scotland who's at the controls of the first tram to carry fare-paying passengers. Passengers Alastair Byres and Norman Steven travelled on the last Edinburgh tram in 1956. Tickets from the last Edinburgh tram in 1956. Lord Provost Donald Wilson on board an Edinburgh tram. Tram passengers will be able to travel with electronic tickets using QR codes. Lord Provost Donald Wilson welcomes Balgreen Primary School pupils and a lifelong Balgreen resident to the tram. Balgreen Primary School pupils with Edinburgh City Council Chief Executive Sue Bruce on board a tram.